The most important boxing match in eight years will be fought this weekend. It will pit the reigning heavyweight champion of the world, Wladimir Klitschko, against David Haye, a cocky Cockney with a gift for knockouts. Besides having the ability to short circuit the brains of his opponents, Haye might also be the most quotable personality in sports. After years of freak-show stunts and a dearth of talent, Haye is also the best hope for the heavyweight division to become meaningful again. Muhammad Ali once proclaimed himself “The Greatest of All-Time.” Mike Tyson once said about Evander Holyfield: “I want to eat his children.” All David Haye had to do was wear a t-shirt. 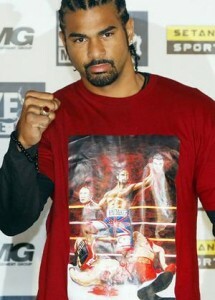 On April 16, 2009, Haye, the unified cruiserweight champion of the world, showed up to a press conference wearing a t-shirt depicting himself holding the severed heads of Vitali and Wladimir Klitschko over their lifeless bodies. Up to that point, Haye had just begun ascending the ranks of the heavyweight division and wasted little time calling out the brothers at the top. Thank you, David Haye. Your sense of fashion may have given the heavyweight division the kick-start it so desperately needed. For the past eight years, the Klitschko brothers have dominated the heavyweight division with a technical, plodding style. Both brothers stand over six foot five and exercise their will by coming forward behind their jab, pressing their opponent against the ropes, exchanging inside before clutching their opponent. It’s a style that wins fights. It’s a style that alienates the casual fan. Haye’s style can best be described as 80% of Roy Jones’ skill combined with 105% of Jones’ power. Haye is not a natural heavyweight, standing only 6’2 and weighing only 220 pounds. 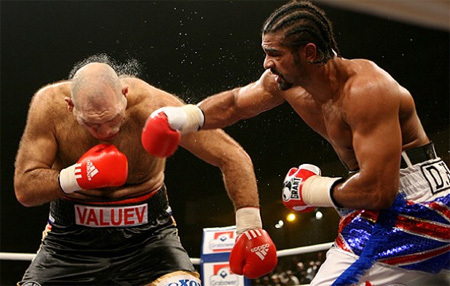 A questionable chin—in other words, his ability to withstand physical trauma to the head without being knocked unconscious—hasn’t stopped Haye from producing action fights as a heavyweight; he was able to knock out John Ruiz and seriously hurt Nikolay Valuev. There’s no higher compliment you can give a fighter than, “He has a questionable chin, but he’s willing to mix it up.” Regardless of whether he wins or loses, no one can say a David Haye fight is boring. When was the last time you were able to see two athletes who genuinely despised each other face off at the pinnacle of their careers? When Rafael Nadal started winning tennis tournaments, Roger Federer was already an old man in tennis years. Shaq and Kobe provided plenty of ill will, but never met with a championship on the line. Brady and Manning had the icy relationship, but they can’t play each other in the Super Bowl with their respective teams. The Stephen Jackson-Ron Artest Pacers hated the Detroit Pistons so much they ended up taking on an entire arena. Baseball has provided us with… uh… hang on… Nyjer Morgan versus Logan Morrison? It’s rare to find two guys who genuinely hate each other facing off in a competition where the point is to inflict as much pain on your opponent as possible. David Haye is clearly excited, I’m excited (though not as excited) and the boxing establishment is worried. Is it any coincidence that three days before the first meaningful heavyweight fight in eight years, Floyd Mayweather Jr. announced he had no problems fighting Manny Pacquiao? Something amazing might happen Saturday afternoon: A meaningful heavyweight division might be reborn.